Initialed and dated in the plate. Georges Rouault was a major painter in the Fauve movement, whose work stands apart from other French Expressionists because he was strongly impacted by the emotional as well as the formal aspects of Van Gogh’s and Gauguin’s art. 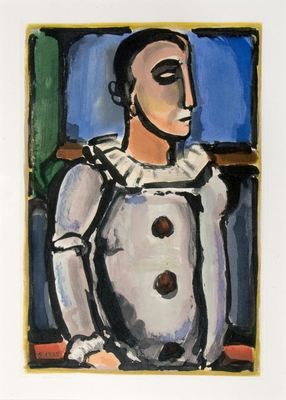 In his youth, Rouault received training in stained-glass making and the heavy black outlines that border expressive color shapes in the aquatint, Pierrot, seem reminiscent of medieval stained-glass windows.